ET phone Earth! We could be on the verge of answering one of the essential questions of humanity that has captivated our minds for centuries. As we advance in technology the search for extraterrestrial life becomes more sophisticated and promising. But the real frosting on the cake would be finding any signs of an intelligent alien civilization. The Search for Extraterrestrial Intelligence (SETI) project is looking carefully for these signs, listening to the Universe that may be full of potential ET signals. In an interview with astrowatch.net, key figures of alien life hunting discuss the ongoing search for extraterrestrial life. SETI's Seth Shostak, Paul Shuch, Douglas Vakoch and Gerry Harp talk the odds of finding ETs, explain the famous "Wow!" signal received in 1977 and unveil the future of the search for aliens. 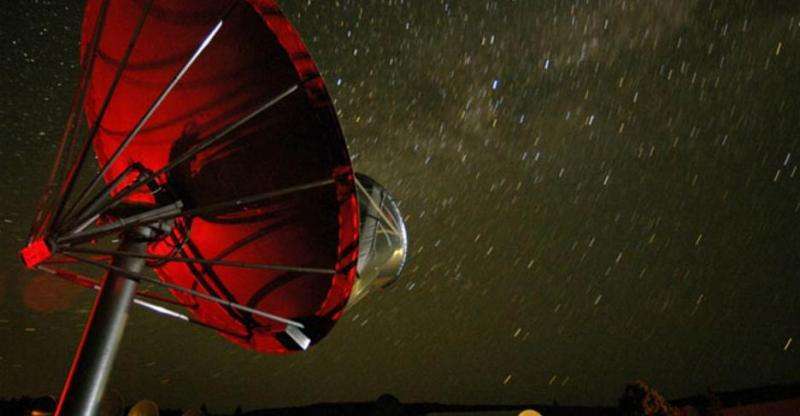 Astrowatch.net: When will we find extraterrestrial life? Will it take less than 20 years as some NASA scientists believe? Seth Shostak: No one knows, obviously. But based on the speed of our SETI searches, I predicted five years ago, in a talk and a paper, that we could find a signal proving the existence of extraterrestrial intelligence within two dozen years. More recently, NASA says the same thing, but "life" not "intelligent life." I suspect they're betting more heavily on finding evidence of microbial life in the solar system. Paul Shuch: I am less optimistic, short-term, though very hopeful, long-term. I believe SETI is a multigenerational enterprise. We have only had telecommunications technology and radio astronomy for less than an eye-blink, on the cosmic calendar. Douglas Vakoch: There are three ways we could find life beyond Earth in the next twenty years. As we explore the planets and moons of our own solar system, we could find evidence of microbial life close to home. As our capabilities for detecting atmospheres of planets circling other stars improve, we might find support for life on those distant worlds. And as we use radio telescopes to look for signals from advanced civilizations through SETI, we could find the telltale signs of alien technologies. Of these three search strategies, only SETI has the potential for a discovery as early as tonight. With enough commitment and funding, any of the three approaches could succeed by 2035. Gerry Harp: It might happen in less than 20 years. If I were to guess, I'd say there is a 50% chance that we will discover life elsewhere within 30 years from now. The first generation of planet-characterization telescopes in space may be coming on line in less than 20 years, but my guess is that life won't be discovered until the second generation. The other way life may be discovered is via SETI. Carl Sagan once famously estimated that there are one million transmitting civilizations in the galaxy. Taking this as a working hypothesis, we will be able to test this hypothesis within the next 10 years. I have little doubt that there are so many active civilizations in the galaxy, but again, we may need more sensitive telescopes than the ones we currently have or will have soon to find ET. So once again, I estimate that there is a 50% chance that life will be discovered via SETI in the next 30 years. There is a substantial chance that within 30 years, we will find life by both methods. Astrowatch.net: In your opinion, what was the famous "Wow!" signal? Was it really a signal from an alien civilization? Shuch: That is one of two reasonable hypotheses. The other is that this was a previously undiscovered natural astrophysical phenomenon. Either possibility is exciting, but we are likely never to know which is the case. Harp: The "Wow!" signal was almost certainly radio frequency interference. The signal failed to pass even the simplest tests to exclude interfering signals from that observation campaign. From another perspective, at the Allen Telescope Array (ATA), we see dozens of signals comparable to "Wow!" every day. This is simply because we have much more computational power than they did back when "Wow!" was seen. If the "Wow!" signal were seen today, it would be a yawn. However, there is a silver lining to the "Wow!" signal. "Wow!" has inspired a lot of public interest in SETI. Despite being a not very scientific result, public awareness of "Wow"! has been beneficial to SETI. So I generally think of "Wow!" as being a good thing from that perspective. Shostak: We cannot say that "Wow!" had anything to do with extraterrestrial intelligence. I was searched for a bit over one minute after first being found, and was not detected again. It was a one-off, and could easily have been terrestrial interference. It's not good science to make claims that this was due to extraterrestrial beings. A scan of a color copy of the original computer printout, taken several years after the 1977 arrival of the "Wow!" signal. It was a strong narrowband radio signal detected by Jerry R. Ehman on August 15, 1977, while he was working on a SETI project at the Big Ear radio telescope of The Ohio State University. The signal appears to have come from an area of the sky with no stars or planets, northwest of the globular cluster M55. Credit: The Ohio State University Radio Observatory and the North American AstroPhysical Observatory (NAAPO). Vakoch: The "Wow!" signal had all the characteristics of a real signal from ET with one critical exception - it never repeated. Without this one essential requirement of science - that observations can be replicated - we have no basis for thinking it was really from an extraterrestrial civilization. Astrowatch.net: Why the "Wow!" signal is so special? How much it differs from the other ordinary signals we receive every day? Vakoch: In the SETI Institute's ongoing search for radio signals from other civilizations, we find promising signals all the time. The critical difference is that we can immediately follow-up to see whether the signal is really coming from a distant star, or whether it's caused by a satellite in Earth's orbit or a radio transmitter on Earth. When the "Wow!" 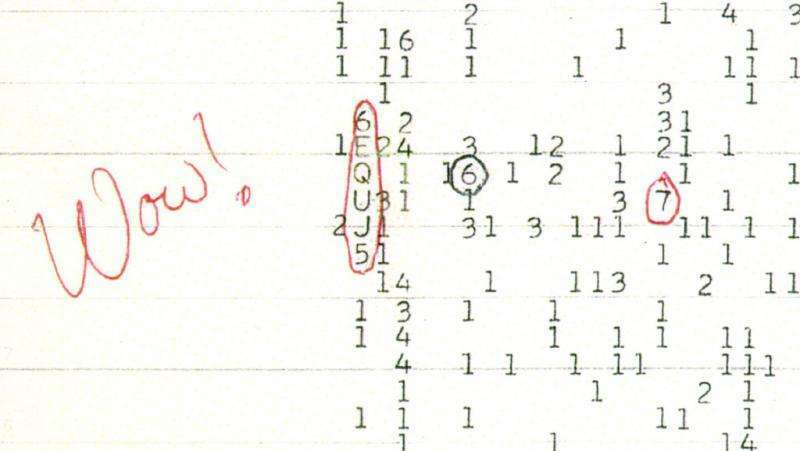 signal was detected in 1977, such real-time follow-up was impossible. Shostak: It's special because the name is appealing. There were more than 100 other types of signals back then, before we had equipment able to quickly follow up on signals. Shuch: There are about a half a dozen tests that can be run on received signals to mark them as being of possible extraterrestrial origin. Many detections pass one or a few of these tests, and remain interesting SETI candidates. The "Wow!" signal was the first detection to pass all of the tests to which it was subjected. Of course, even that is not conclusive evidence, because there was no independent confirmation, a necessary condition for certainty. Harp: It isn't at all special or different from signals that we observe every day at the ATA. I hope you're not disappointed that I'm not so impressed by the "Wow!" signal. I think you will find that many professional scientists in the field do not find the "Wow!" signal very convincing. But that doesn't mean that SETI isn't a good thing to do. There is still a 50% chance, by my estimates, that our first discovery of life off of our planet will be a discovery of a transmitting civilization. Astrowatch.net: Do you think that we will receive similar signals in the future? Shuch: We will in the future; we have in the past. We continue to see a few interesting candidates every year. The "Wow!" was merely the first such phenomenon to be observed, and then extensively sought in follow-on experiments. Until such time as they can be independently verified, all signals are enigmas. Shostak: Less probable. Many SETI experiments, including ours, have the ability to "follow up" almost immediately. When you can do that, "Wow" type signals don't seem to occur! Harp: We see such signals all the time. To answer a different question, we do sometimes observe signals that look even more interesting, from our perspective, than "Wow!" Sometimes the signals that repeat – "Wow!" was not repeatable - that carry on for some time and then disappear. I wish I knew more about such signals, but if we can't prove a signal really is ET, it is our duty to not make a big deal about it. Vakoch: We receive promising candidate signals every night, but so far, they don't repeat, so we have to assume they're made by humankind. Astrowatch.net: How much closer is SETI today to finding signals from extraterrestrial civilization? Vakoch: We could find a signal from extraterrestrials any day now. And the search will get better as technology advances. In the next twenty years, we should be able to look closely at about a million stars for signs of advanced civilizations, and that's a large enough number to have a reasonable chance of finding intelligence in the cosmos, if it's really out there and trying to make contact. Harp: Although I am rather conservative about when we will find ET, there is always a chance we will find it today or tomorrow. We are observing with the ATA every day, 12 hours a day. It could happen any time. Shuch: We are in the phase of developing hardware, software, and other tools for designing and conducting our experiments. We are still in our technological infancy. Astrowatch.net: What needs to be done to better detect potential signals from ETs? Shuch: We need to dramatically increase our coverage of the search space, by bringing online many more observing stations, monitoring a wider portion of the electromagnetic spectrum, operating around the clock, and coordinating among themselves to provide independent verification of candidate signals. Shostak: The real problem is lack of adequate money to do the experiments. Vakoch: SETI searches through the cosmic static, looking for signals that stand out from the background noise as distinctly artificial, signals that nature can't create. We need a lot of computing power to sort through all that data. The good news is that computing power increases every year, so the normal trajectory of technological progress is on SETI's side! Harp: We need faster signal processing. The ATA is actually not sensitivity limited. We are limited by the large amount of so-called radio frequency interference in our observations. In order to find ET faster, we need to be able to process a larger number of candidate signals and this requires a lot more computational power. If I were king, I would upgrade the electronics at the ATA with a $10 million dollar analysis system to increase our observing speed one hundred-fold. Then we'd crank through observations of the entire sky and find ET in a lot less time. To find ET you'd need to be able to not only detect all EM frequencies, but also cross-reference those frequencies to detect broad-band communications. The communications will also be in an alien language and will be encrypted (they need to protect their date the same as we do) so looking for an intelligent signal among random background noise will be difficult. An encrypted, broadband signal will look like...random background noise...UNLESS you already have the algorithm and know what to look for. Assuming the aliens are not trying to be cryptic, that they are trying to contact us, is naive, but even if that were the case we might not recognize the mathematical constructions of their language. Can Seti even tell us how they expect to identify the definite article* or indefinite article* of an alien language among all of that mathematics? These are the most common words in most languages, essentially the "The", "A", and "Of" words. recognizing an alien signal would be like intercepting a message between my PC and my ISP in an unknown language in an unknown format or protocol. See, the logical prop underpinning SETI optimism is this: intelligent life arose on Earth, therefore it's possible it could have arisen elsewhere. But when you give up on the idea of intelligent life on Earth... the odds for finding it elsewhere don't look so hot, huh. editor-b is not helping our confidence level. Returners, to find them, one only needs to know where the energy source is coming from. One doesn't have to decipher the contents of the message to know where it came from. An example would be communication by flashlight using morse code. If I don't understand morse code, I can still see where the flashlight is shining from. Replace flashlight with radio signal, and morse code with impossible encrypted alien language, and I think you can see their logic then. "We could find aliens any day now"
The opposite outcome is far more likely. "We might not ever find aliens." This is just as likely an outcome - many would say this is much more likely of an outcome. OR ... Who know? We COULD witness the Flying Spaghetti Monster landing on the planet any day now! Let's stick with science. How long do we keep on searching for something that may very well not even exist? Have none of you watched the "History" channel? Them old Aliens built the pyramids, gave us fire, and invented all our technology.